Equipment: cable TV; internet access Wi-Fi (included); underfloor heating. Feature: Property in a multi-family housing (max. 3 floor(s), 1 building(s) in total). Furnishing: tasteful, friendly, bright, parquet floor. Please note: Owner lives in the house. apartment, 4 - 6 people, 3 room/s, 2 bedroom/s, 1 bathroom/s, approx. 66 m², 1 floor/s, apartment on ground floor, year of construction 2010. Kitchenette: Kitchen/ cooking equipment: 4 ceramic hobs, oven, microwave oven, dish-washer, refrigerator, coffee machine, toaster. in the living room. Living room/bed room: furniture suite, double sofa bed, exit. Sanitary 1: shower, separate WC. Estate: (shared use with permanent tenant) Permanent tenants live on the property. Important information: Indoor Pool, wellness area and the restaurant are at the hotel "Hirschen" (in approx. 500 m). Indoor swimming pool: (shared use): 14.5 x 5.5 m, heated. Infrastructure: Restaurant; half board (dinner): payment and request on-site. Situation: suburbian area, residential area, panoramic view. Wellness: payment: massage, treatments. shared use (free of charge): sauna. Arrival: Airport Innsbruck in approx. 60 km. Train station Imst in approx. 7.5 km. Beach/waters: Lake (bathing possibility) in approx. 20 km (Piburger See). Pond (bathing possibility) in approx. 3 km (Hoch-Imst). Bus stop: Bus stop in approx. 10 m.
Cross-country skiing trail (from 14 DEC 2019): in approx. 500 m.
Golf course: (9-hole golf course) in approx. 30 km (Mieming). 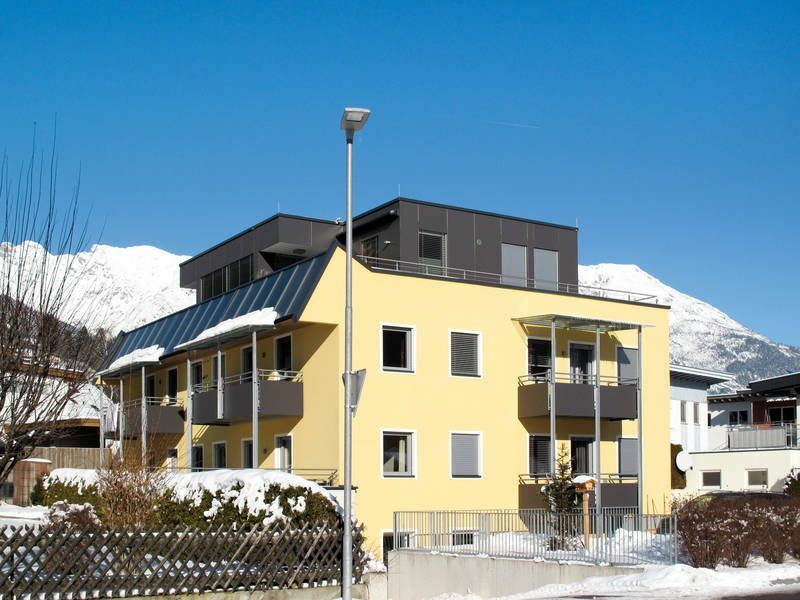 Next village/town: Center Imst in approx. 500 m. Innsbruck in approx. 62 km. Public swimming pool (from 14 DEC 2019): Public outdoor swimming pool in approx. 500 m, free entrance for INTER CHALET guests. Public swimming pool (to 14 DEC 2019): Public outdoor swimming pool in approx. 500 m.
Shopping: Next shopping possibility in approx. 500 m. Next supermarket in approx. 1 km. Ski bus stop (from 14 DEC 2019): in approx. 500 m.
Ski run (from 14 DEC 2019): in approx. 3 km (Hoch-Imst). Super Ferienwohnung, sehr freundliches und hilfsbereites Personal. Eine schicke, moderne Ferienwohnung mit allem Komfort und gutem Service. Wir haben sie eine Woche lang als idealen Stützpunkt zum Klettern in der Region genützt. Einziger Wehrmutstropfen war dass es ein paar Tage gedauert hat bis WLAN verfügbar war. Die technischen Probleme bezüglich W-LAN sind behoben. Es funktioniert wieder einwandfrei.